A seemingly innocuous statement by Vladimir Putin was used by the Kazakhstani and foreign media to generate a controversy between Russia and Kazakhstan. A statement made by Vladimir Putin about Kazakhstan at the Seliger Youth Forum late last month unexpectedly provoked a wave of official statements and media coverage in both countries. The Russian President said, “Kazakhstan has never had any statehood. He (President Nursultan Nazarbayev) created it.” The Kazakhstani public, particularly the nationalists and patriots were peeved with those words. Several virtual protest actions were held in the country, like a flash mob on social media sites that demanded a history book be sent to Putin. On the very day after the Russian president's announcement, reports filled the Western, Kazakhstani, Ukrainian, and liberal Russian press about Nursultan Nazarbayev’s supposed reminder in a television interview that Kazakhstan has right to leave the Eurasian Economic Union (EEU) if it is prejudicial to the country's interests. Many observers and experts were quick to make declarations about the Putin-Nazarbayev rift and EEU crisis. The most surprising thing about this story is that the Kazakhstani president gave his interview 5 days prior to Putin's famous statement at Lake Seliger. It is plain to see that that this is an artificially inflated media conflict which has led all the same to apologetic and explanatory statements by officials in Russia and Kazakhstan. 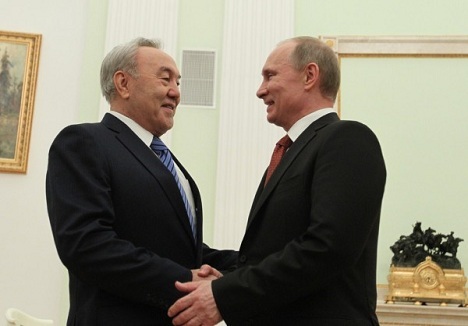 The vested interests for a conflict between Russia and Kazakhstan are obvious. Officially, Astana is Moscow's closest ally and the most consistent partner in the integration process in the post-Soviet space. The importance of Kazakhstan for Russia has increased dramatically since the start of the Ukrainian crisis and introduction of sanctions against Moscow. Kazakhstan and Belarus have supported and will continue to support Russia greatly during the conditions of growing antagonism in its relationship with Western countries. It is no coincidence that the Kazakhstani and Belarusian presidents were key moderators at the meeting held between Vladimir Putin and Petro Poroshenko in Minsk. The loss of Kazakhstan as an ally in such a situation could prove a very painful blow to Russia. It is obvious that the statements about Kazakhstan's potential exit from the EEU are most likely to remain words. Nursultan Nazarbayev, as an experienced politician and leader who has been running Kazakhstan since the late-1980s, understands and senses the public mood in the republic very well and plays ahead of the curve. It was he who at one time strongly opposed the creation of a legislative body for the EEU, the function of which, in his opinion, went beyond just economic integration. Moreover, Nursultan Nazarbayev is the chief initiator and source of inspiration for the creation of the Eurasian Union in its current form, so Kazakhstan’s membership in it, as well as the success and effectiveness of the union is something Nazaybayev’s reputation hinges on. However, there are a number of unknowns in this whole story. The reaction of Kazakhstani society to Vladimir Putin's statement is understandable, as are the attempts of external parties to inflict the maximum damage on relations between Russia and Kazakhstan. It is not yet clear what indeed prompted the Russian president to make this claim. On one hand, the statement can be interpreted unambiguously as emphasizing the role and place of Nazarbayev in establishing Kazakhstan's statehood. In addition, the Russian president's evaluations largely coincide with the speeches of the Kazakh leader himself and representatives of the republic's political circles. On the other hand, such a statement seems inopportune in conditions of serious confrontation with Western countries, as it caused a quite sharp and bitter reaction even from those people in Kazakhstan who favour cooperation with Russia and have been supporting it during the Ukrainian crisis. The harsh statements of the leader of the LDPR, Vladimir Zhirinovsky, which were made only a few days before the president's trip to Seliger, created a negative background for Putin's remarks. The deputy speaker of the State Duma declared in his characteristic undiplomatic matter that a “Russophobic mood is being cultivated” in Kazakhstan and that the question of territorial claims on Kazakhstan will be raised after the Ukrainian crisis is resolved. Meanwhile, in spite of the Ukrainian crisis and sanctions being levied against Russia, work on the creation of the EEU continues. The Eurasian Economic Commission holds regular meetings in parallel with preparations for the entry of Armenia and Kyrgyzstan into the Customs Union and the EEU. On September 2, the Treaty on the Creation of the EEU was submitted to the State Duma for ratification, which means that the integration process between Russia, Kazakhstan, and Belarus will enter a new stage. Stanislav Pritchin is a political scientist and researcher who is attached to the Centre for Central Asia, the Caucasus, and the Volga-Ural Region at the Institute of Oriental Studies, Russian Academy of Sciences.